In 1995 (1) the SEB perceived themselves in a difficult situation. Customers were demanding increased services, as they were beginning to save in funds, to trade on the stock market etc. To meet this SEB would need to have some 2000 branches. At the same time customers became more and more reluctant to pay for services. Therefore SEB should really have 0 branches. We were invited to work on the situation. When looking at the way traditional banks interacted with their customers, we concluded that "there's got to be a better way to do this". 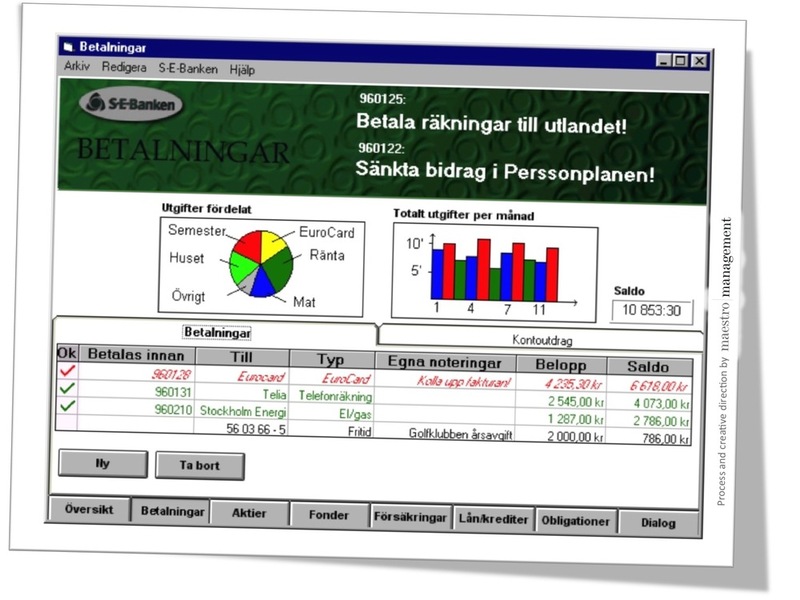 Lars Albinsson designed and led the process to develop a new service concept. The first insight was that most Swedish customers interacted with the bank each month, paying their bills. We took this as the starting point and designed the Internet banking service to offer ease of use, safety and security. The Internet service gave the customer an summary of all accounts, payments, stocks and funds. This was much appreciated as the difficulty in getting an overview of your financial situation using just the paper statements sent each moth was key problem for the customers. One innovation was that you could enter payments far ahead, letting the bank make sure they were paid as late as possible. The very first prototype. Developed by Lars Albinsson's team at Unusual Systems. This is the very first prototype, produced by our team. The payment and transactions processes was designed to maximize overview and control for the customers. Even if you computer crashed, once online again you should immediately know the status of all pending transactions.